New Delhi: The Supreme Court on Thursday posted till January 29, the hearing in the Ayodhya land title dispute case after the exit of one of the five judges in the Constitution bench. Justice UU Lalit recused himself saying he had been a lawyer in a related case nearly two decades ago. A new five-judge bench will be constituted to hear the matter. 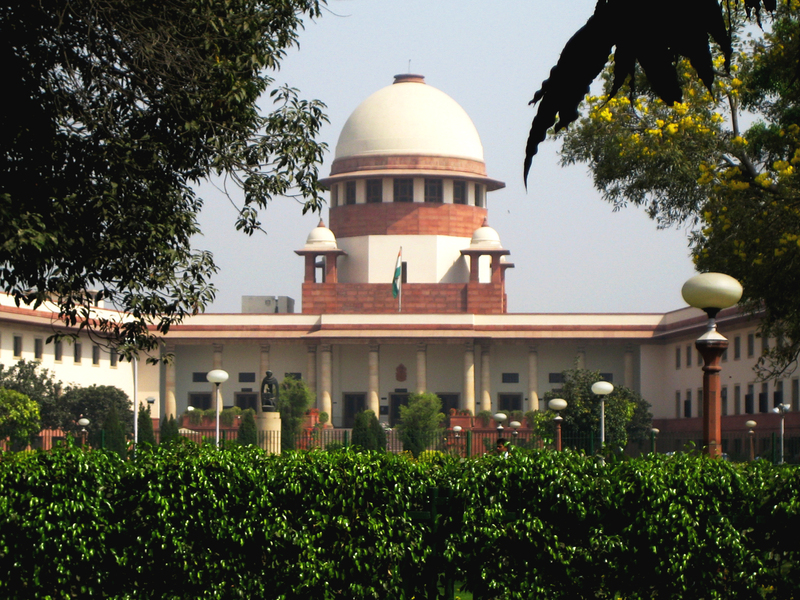 On its next hearing, the apex court is expected to fix a timeline for the next hearing. Meanwhile the perceived ‘delay’ in the Ayodhya case hearing on the Ram Mandir issue has evoked strong reactions from the proponents of the temple movement the RSS and the VHP. “It is unfortunate that the hearing has been delayed yet again,” RSS leader Indresh Kumar told a private TV channel. He further said as of now “sab anishchit hae (everything seems uncertain)” – on the time frame of the court hearing on the high profile case. “So far an impression is being created that this is not an urgent case. If this mindset continues, then it will be a case of justice delayed is justice denied. This will be unfortunate for the country,” Mr Kumar said. “It will be good that the hearing takes place at the earliest as the entire country is waiting for a verdict. Prime Minister Narendra Modi has also said that there should not be hurdles. Entire country wants a verdict on it at the earliest,” he said adding ‘delaying’ will be very unfortunate. Mr Kumar, however, recorded his appreciation for Justice U U Lalit for easing him out of the bench after counsel Rajeev Dhawan raised the issue that Justice Lalit had appeared in a criminal case on behalf of Kalyan Singh regarding the same issue on 1997. 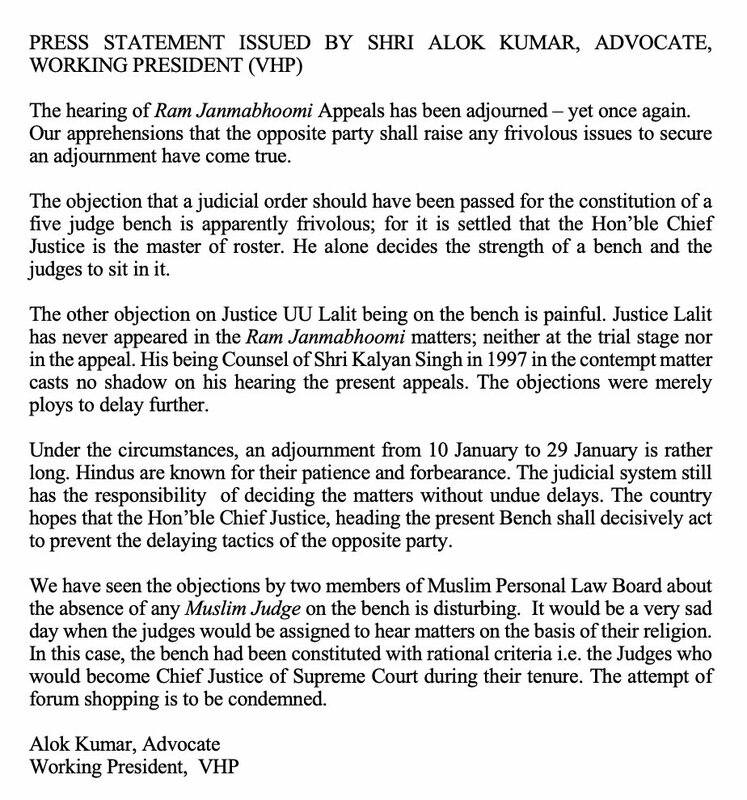 VHP working president Alok Kumar said the ‘objections’ raised by a counsel during Thursday’s hearing on the presence of a judge in the bench was uncalled for. “Such matters are decided by the Chief Justice of India, who is the master of the roster,” he said. Justice Lalit had only appeared in a contempt case for former UP Chief Minister Kalyan Singh and that had nothing to do with the Ram Mandir-Babri Masjid dispute. “Thus the objection about Justice Lalit being part of the bench is unfortunate,” he said.